Chaired by Vice President Mike Pence, the space council met at the Kennedy Space Center Wednesday to review recommendations that will be sent to the president for approval, re-iterating the administration’s push to end government funding of the International Space Station in 2025 in favor of one or more commercially-developed follow-on outposts. “President Trump and our entire administration believe that America’s prosperity, security and even our national character depend on American leadership in space,” Pence said in a cavernous room where space station components were once assembled and tested before launch. Pence arrived at the Kennedy Space Center on Tuesday, landing aboard Air Force Two at NASA’s former shuttle runway. 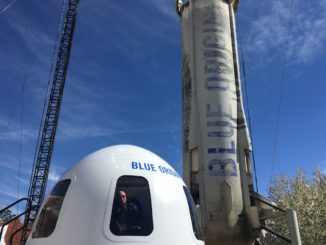 He promptly toured a United Launch Alliance processing hangar, getting a close-up look at a Delta 4 heavy-lift rocket scheduled to launch a solar probe later this year, and then visited Blue Origin’s huge new rocket factory where Amazon founder Jeff Bezos plans to build a new family of orbit-class boosters. 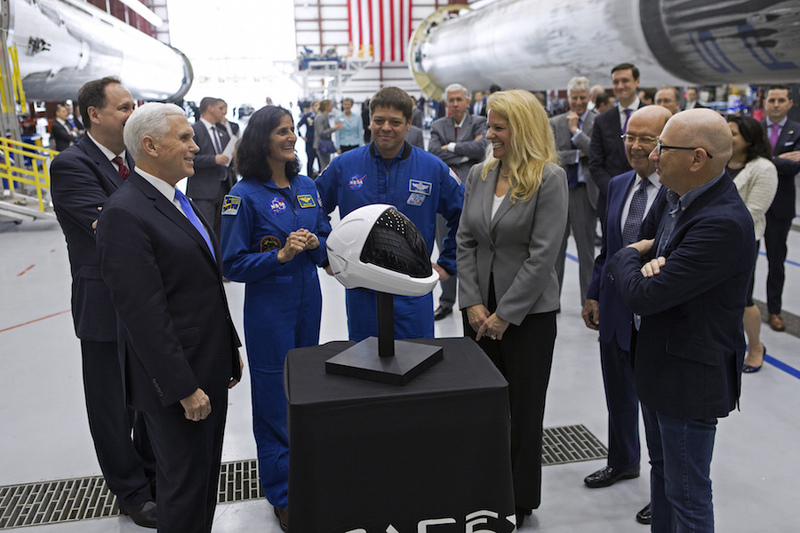 The vice president and his wife later attended a reception with space dignitaries and executives that was closed to the news media. 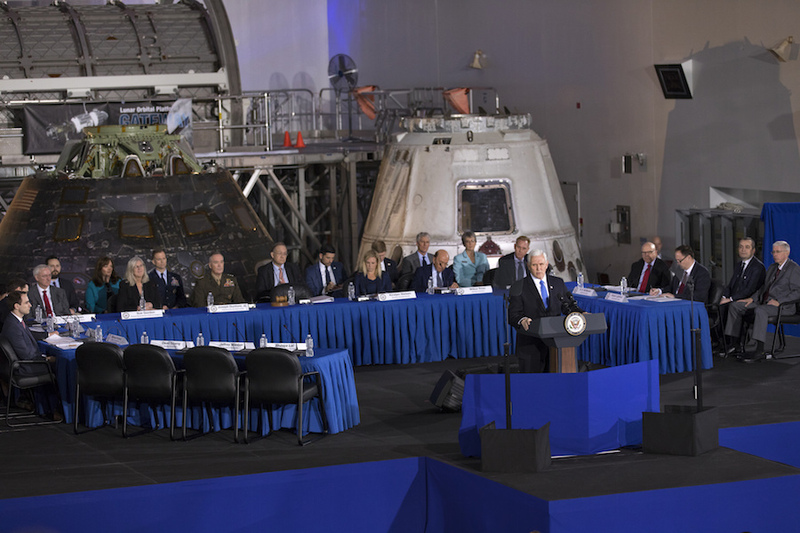 But Pence announced 29 nominees to serve on a space council advisory panel, including moon walker Buzz Aldrin, Eileen Collins, the first woman to command a space shuttle mission, and a variety of other luminaries from business and academia. During Wednesday’s public session, Jeffrey Rosen, Deputy Secretary of Transportation, outlined a 45-day plan to overhaul, modernize and streamline the space licensing framework to speed up FAA reviews, expand the use of waivers to gain quick “interim relief” and to set up a joint task force to ensure better cross-agency cooperation. The new licensing framework is aimed at enabling a much more rapid “file-and-fly” application-to-approval process. Secretary of Commerce Wilbur Ross said the space business is a $330 billion industry supporting 211,000 jobs. Since the space council’s first meeting last October, a review of an “outdated regulatory framework” and “discussions with an ambitious but frustrated space industry made it clear that the rate of regulatory change must match the rate of technological change,” Ross said. Pence outlined four recommendations based on the council’s work since the first meeting last October that will be sent to the president for approval. First, the Department of Transportation will be directed to replace restrictive launch and re-entry licensing regimes with a more streamlined system by March 1, 2019. As outlined by Ross, the Commerce Department will move all space commerce responsibilities into a single office monitored directly by the secretary to facilitate mission authorization for commercial space initiatives. Space-related export control requirements also will be streamlined, with a new framework in place by Jan. 1, 2019. And the National Telecommunications Information Administration will work to develop guidelines for protecting the radio frequency spectrum used by satellite systems to encourage expanded commercial space activities. 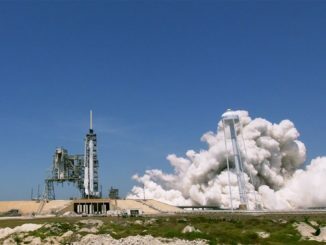 “These recommendations, I believe, will transform the licensing regimes that oversee launch, re-entry and new commercial space operations, and they’ll empower American businesses to create the jobs of the future, attract new investment to our shores and unlock new opportunities, new technologies and new sources of American prosperity,” Pence said. But the council was warned that America’s leadership in space faces major threats and challenges from Russia and China, which are both working to develop ground- and space-based anti-satellite weapons while expanding their own commercial presence in space. 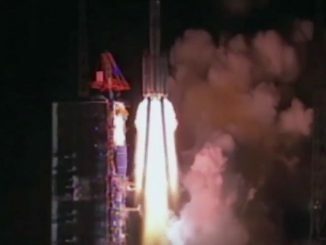 Dealing with China will be particularly tricky, the council was told, given a pervasive military involvement in all aspects of the nation’s space program and the ever-present threat of technology transfer. Even so, the council was urged to find a solution that might enable private sector space cooperation. “The United States cannot simply ignore China’s commercial space ambitions,” said Jeffrey Manber, president of NanoRacks Corp., a company that helps businesses and schools launch payloads to the International Space Station.